DOUBLE denim is no longer the fashion minefield it once was. It’s hit the fashion world with a panache. Made famous and covetable to the mainstream by Marilyn Monroe when she wore a Lee denim jacket with classic blue jeans in the 1961 film, Misfits, but it was 40 years later that Justin Timberlake and Britney Spears turned the trend into a fashion statement reserved for the tacky. But why the resistance to double denim? Most of us have the ingredients in our wardrobes, which, you would think, would make us receptive to the look. 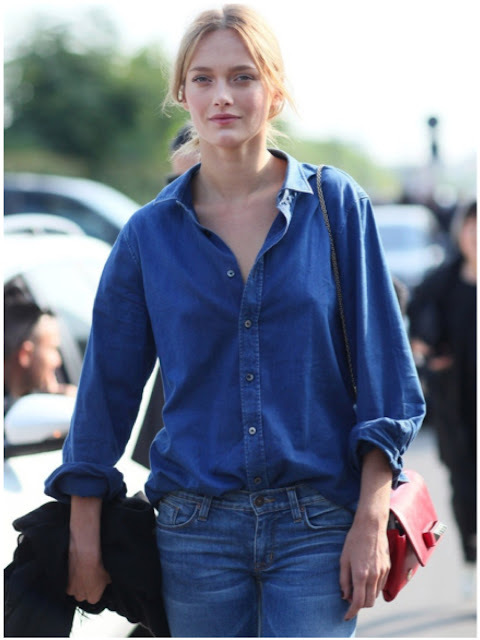 And compared to some other trends, double denim is blissfully undemanding of physical perfection. However, the look underwent an unwavering revival during recent seasons and suddenly denim-on-denim pairings became a paragon of casual chic. Fashion magazines worldwide applauded the return of double denim. And a trend wouldn’t be a trend without some sort of debate. This time around the tricky trend has divided opinion with the fashion industry. Of course, not everyone agrees. As you would expect, there are two schools of thought in doing double denim. Many stylists and fashion editors, without discounting the trend altogether, were quick to point out the hard and fast rules of successfully pulling off the look. It has been tirelessly suggested that colours should always contrast, never match. Or to mix dark denim shades with light. Or to wear different colours such as faded black jeans with a stonewash blue trucker jacket or chambray shirt. Or don’t wear the same wash together. And never pair the same colour denim because it’s too matchy matchy. Or mix slim and loose silhouettes. And so it goes on. Then there are those that think the double denim trend belongs in the if-you-remember-doing-it-the-first-time around-avoid-it-this-time camp. I disagree. You can read more here. I actually don’t mind the double denim look. There are some fabulous new washes and treatments these days, so why not pair two pieces together. But (and it’s a big but) only if the wash and style are complementary. Just as there are many different treatments and textures, weights and washes of denim, there are just as many many different hues of blue. So play it stylishly safe and stick to the same or complementary colour families. And I’m all for contrasting denim … there’s nothing more stylish than a fabulous pair of dark denim slim leg jeans with … well, anything really. But there is one denim I’m not a fan of and that’s chambray. However, having said that the lighter colour is absolutely huge this season! Try Levis, Lee and Wrangler for more traditional styles. If you’re looking for more fashion forward denim designs try international labels such as Earnest Sewn, Frame Denim, 7 For All Mankind, Citizens of Humanity, J Brand, Paige, Acne, Current/Elliott plus plenty of others all available online at Net-A-Porter, Shopbop, My Theresa and Stylebop. For local brands you can’t look past sass & bide, Trenery and Sportscraft. If you want to explore chambray and denim tencel options then try Good Day Girl, and Country Road. And I’m sure there are plenty of others I’ve failed to mention. 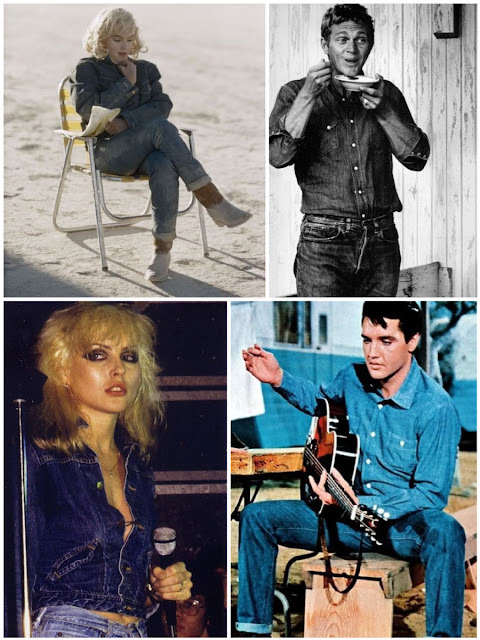 So get inspired by the icons – think Marilyn Monroe, Deborah Harry, Elvis and Steve McQueen in their classic styling – and play with the mix of modernity and authenticity and put your own personality into it. To hell with the rules! It is more about the wearer’s personal style and attitude than about applying strict rules to an outfit. Whether you’ll do double duty or not, one thing is for sure: denim, in all its forms, ain’t going nowhere! Denim jeans – and even a denim trucker jacket – are absolute essentials that every woman needs in her wardrobe. 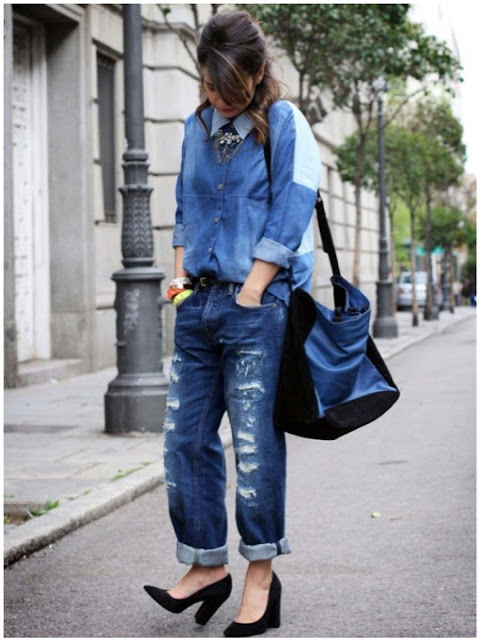 What do you think about double denim? Are you a fan?